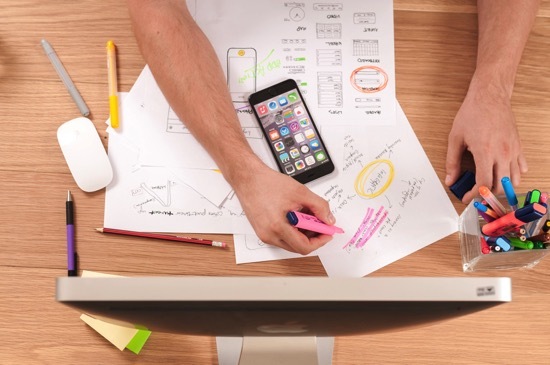 In today’s digital era, it’s not a stretch to expect that every business understand the importance of user experience (UX)–especially as it relates to your company website. A well-designed and mobile friendly website is, quite simply, table stakes in today’s Internet-fueled world. When talking about your website, consider this: 96 percent of the time a prospect visits your website they are not ready to buy. What’s more, you’ve got eight seconds or less to get their attention. What are you doing to give them the experience (and the information) they seek when they find their way to your website? The experience you create for them for in that exceptionally short period of time has a big impact on what happens next. 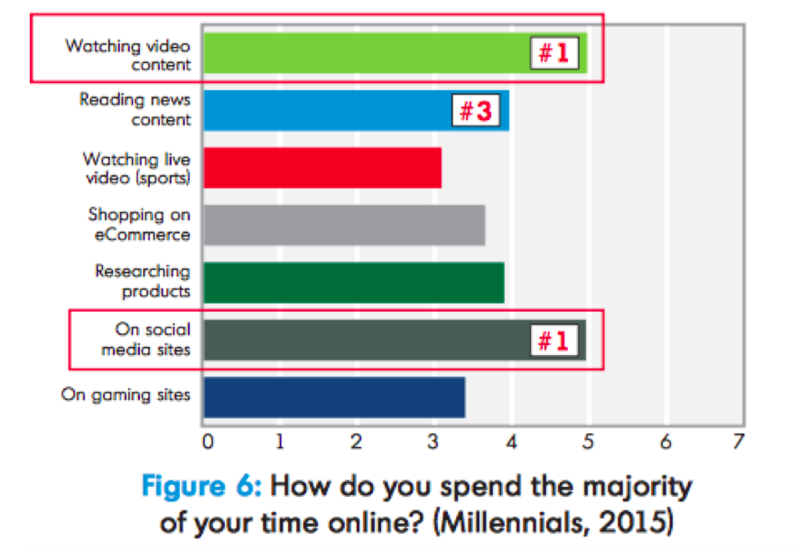 In something that’s no news to anyone, people are spending more time online than ever before. Go outside, go into any restaurant, airport, mall, or public space, try to count how many people have their noses buried in devices. Then give up, because the number will be too large to keep track of. The increase in the last 12 months has been dramatic, as this graphic from the report illustrates. Over this past year, the number of people who admitted to spending 15+ hours a week online (not including work-related online usage), rose from 23 percent to almost 45 percent. Cumulatively, those spending more than 10 hours a week online has risen from 36.6 percent in 2014 to 64 percent in 2015. That’s a lot. Not surprised, you say? 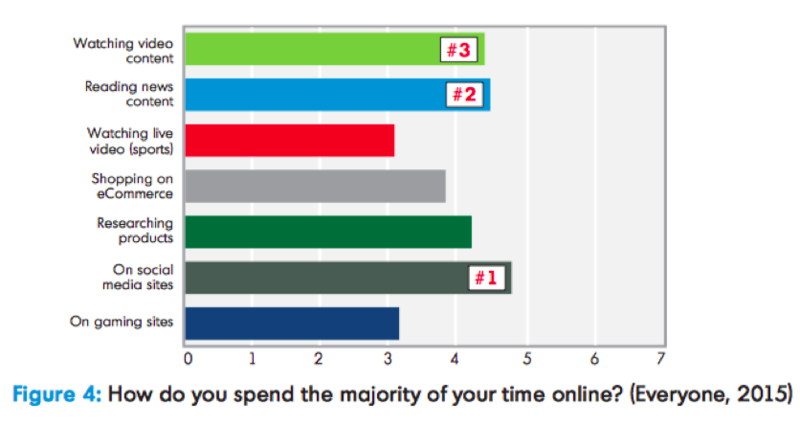 What if I told you that, stereotypes aside, it’s not the young’uns leading the charge on increased time spent online—it’s the boomers! Limelight’s data showed Millennials trailed behind the Boomers, in time spent online, 41 percent to 51 percent. A statistical blip or the first signs of a new trend? Does this surprise you? Then I challenge you to pop into your local Apple store and take a quick count as to how many older folks you see there compared to those in the 18-24 age group. Frequent traveler? Look around at your fellow airport patrons—you’ll see massive device adoption by both Boomers and GenXers. Sure, plenty of young people are tethered to their devices, but they aren’t alone in that regard. We are ALL online more, and by and large ALL using our omnipresent devices for that access. So, what is everyone doing during all that online time every week? In 2014, the split between different activities was minimal with news content coming out ahead by a narrow margin. This year though, as this graphic illustrates, social media sites account for the most activity. It’s no surprise that video consumption also features strongly, with Millennials naming video and social jointly as their number one online activities. The influence of video among the Millennial cohort is a factor that I wrote about earlier this year when I highlighted research from a Google/Ipsos study. The study suggested that 98 percent of smartphone-owning Millennials view video content daily on their device. Not only that, they are also likely to be more focused on the video content they’re viewing on their mobile devices than they are when watching TV. Take note marketers—ignoring video is bad. Ignoring mobile optimized video, even worse. This should be something that encourages content marketers everywhere but it should also come with a warning. More content doesn’t equal success, and cramming your blog or website with spammy business jargon and sales’y marketing messages is a sure fire way to drive people away. Content that informs, educates, entertains, and provides value to your reader will help you not only attract website visitors, but ultimately also entice them to do business with you. Are we Becoming Less Impatient? How long do you wait these days for a page to load before moving on? Two seconds? Five seconds? Nothing makes me crazier than a slow loading anything, and it’s a killer for any website. Surprisingly, the survey results suggest that user patience may be increasing, with the percentage of those willing to wait more than five seconds increasing from 40.79 percent in 2014 to 51.58 percent this year. This in turn appears to be having a positive impact on brand reputation, with more respondents indicating that they would be less likely to turn to a competitor due to a slow load speed. A word of caution though for anyone thinking that they can compromise on the performance of their website. The survey also highlights that over this past year mobile users are moving in the opposite direction, with a dramatic drop in those willing to wait for a page to load. Smartphone usage is exploding, particularly among Millennials and Generation Z, and more of us are researching and shopping while on the move than ever before. Online holiday sales were predicted this season to hit 83 billion, with mobile predicted to drive the majority of visits for the first time ever. Kind of a big deal, no? I don’t know about you, but I’ve not yet set foot in a store for any of my holiday purchases, and at least 50 percent of my purchases have been made from a device. What about you? Users seem to be getting slightly more forgiving when it comes to brands gathering their personal data, and data shows they would rather a website remember their details and serve up a more personalized experience on their next visit. The increase from 26.7 percent to almost 43 percent in just 12 months is a significant move. The study doesn’t touch on security concerns but, while these are sure to remain, it seems that web users are at least willing to trade some of their personal details for a more personalized experience. With this study still only in its second iteration it’s probably too soon to draw too many firm conclusions from the results. What it does prove though, is how important the website user experience is for users and how fluid the trends surrounding web use can be. It’s vital for brands and marketers who want to attract customers online turn their focus to creating the absolute best user experience possible. We also need to be constantly evaluating the data that’s available to us, as well as feedback from customers, about what makes an online experience a great experience, and using that feedback to drive strategies moving forward. Don’t make the mistake of thinking you need to be a huge business to leverage big data to help create stellar user experiences. You just have to commit to making it happen, and there are many solutions out there to help you along the way—many of which are incredibly affordable. All graphics are from The State of the User Experience Report. Shelly Kramer is a 20+ year marketing veteran and CEO of V3 Broadsuite, a marketing consultancy, and the President of Broadsuite Media Group. She’s also a founding partner in Futurum, a research and analysis company, and a founding partner in XVA Labs, a company focused exclusively on helping brands navigate the process of digital transformation as it relates to corporate culture. Shelly is a brand strategist focused on digital transformation, and delivering integrated marketing solutions for clients. She’s an expert at lead gen, omnichannel marketing, all things tech-related, content strategy and execution, connecting social media to business initiatives, and helping clients leverage the web for growth and profitability. Research conducted by Onalytica throughout the course of this last year named Shelly as #42 on their list of Big Data: Top 100 Influencers and Brands for 2016, #38 on their list of Content Marketing: Top 100 Influencers and Brands for 2016, #38 on their list of Future of Work: Top 100 Influencers and Brands for 2016, and #66 on their IoT: Top 100 Influencers and Brands for 2016 list. This recognition indicates that when it comes to all things related to technology and how it powers business today, she brings a wealth of experience to the fore. She was also recognized as one of MediaPost’s Top-100 Social Media Power Influencers, 2015 Edition, and has been recognized by Forbes on a number of occasions, most recently as one of the Top 40 Social Selling Marketing Experts and Top 50 Social Media Influencers. Shelly is part marketer, part tech analyst, part futurist, and all geek, with a propensity for numbers, and producing results. You can find her on LinkedIn and Twitter.